It was a dark and faintly forbidding building on Market Street, Newcastle – but you can’t miss it now. The former nightclub, most recently called Venue but previously Tuxedo Junction, is now ¡Vamos! Social, the new permanent home of the annual festival of Latin American culture. In keeping with the festival’s reputation, it has now put on a colourful face courtesy of Peruvian artist Elliot Tupac. Elliot visited Newcastle during the recent 10th ¡Vamos! festival but got straight to work, giving this corner of the city a visual flavour of his own home city of Lima. 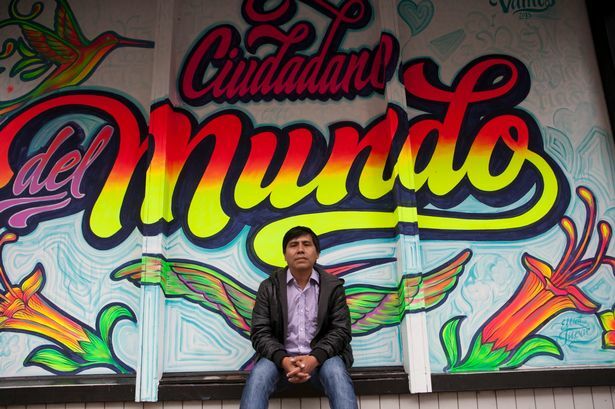 Specialising in screenprinting and lettering, Elliot’s style celebrates the tradition of the Cartel Chicha whose colourful murals transformed grey industrial areas of Peru’s capital. His Newcastle artwork, Citizen of the World, reflects his feelings as he embarked on a UK tour. “As tourists, migrants or even refugees we should all feel we are citizens of the world,” he said. Nik Barrera, festival director and manager of ¡Vamos! Social, said Elliot had been the obvious choice to bring the venue to life. “When we first started working on transforming the venue it was cold and dark so we knew his work was a perfect fit,” he said. Nik said the response to this year’s festival had been “overwhelming” with the concert by Kid Creole &amp; The Coconuts elevating it to another level.